Better late than never. That has become one of my life's mottos. I have always been sort of obsessed with getting things done on time. But life gets complicated and I've learned that I have to adjust my expectations about myself (and others) or go crazy. I'm still obsessed with living up to my commitments, I've just learned that I have to accept it may be on a different time table than I wished or envisioned. And that's okay. The last couple of weeks threw me a real curve. Our sweet pug boy, Logan, was diagnosed with very aggressive osteosarcoma of the jaw. Without going into a lot of detail, we had to make a fairly quick and very difficult decision, and last Tuesday, Logan had surgery to have his entire left, lower jaw removed. Today, less than a week later, he is doing remarkably well -- he re-learned how to feed himself less than a day after surgery, he is getting around well, the swelling is down, and he is in great spirits. Many thanks to wonderful veterinary surgical oncologist, Dr. Christine Warzee and the very caring staff at Animal Cancer & Imaging Center. He will start chemo soon and our hopes remain high that we will be enjoying his company for a long time to come. Above you see a photo of Logan (right), post-surgery, taking a little siesta in the sun with his adopted sister, Yue Ying. And now, on to belatedly honor a commitment I made at the beginning of January -- posting the pattern for the Double Trellis Cowl/Infinity Scarf that appeared in my post on October 14, 2012 titled "What is Gossamer?". I've had a few people ask how to make it, and I've finally written up the pattern (posted below). It is very easy. 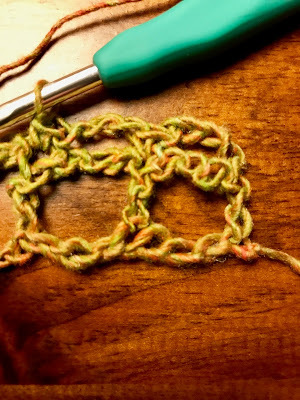 You only need to know three stitches: chain, single crochet, and double crochet. I also recently made a variation to this pattern to create my Lavender Seas Trellis Cowl/Infinity Scarf, which includes a bead crochet section. At the end of the pattern, I've posted an addendum about how to do this modification for anyone who'd like to try it. Finished size: Approximately 8 inches wide by 60 inches in circumference. Row 1: Double crochet (dc) in 10th chain from hook. *Chain (ch) 3, skip 3 ch, dc in the next ch* .Repeat from * to * until you reach the end of the row, ending with dc in the last ch. (You should have 11 "squares".) Turn. Row 2: Ch 4. 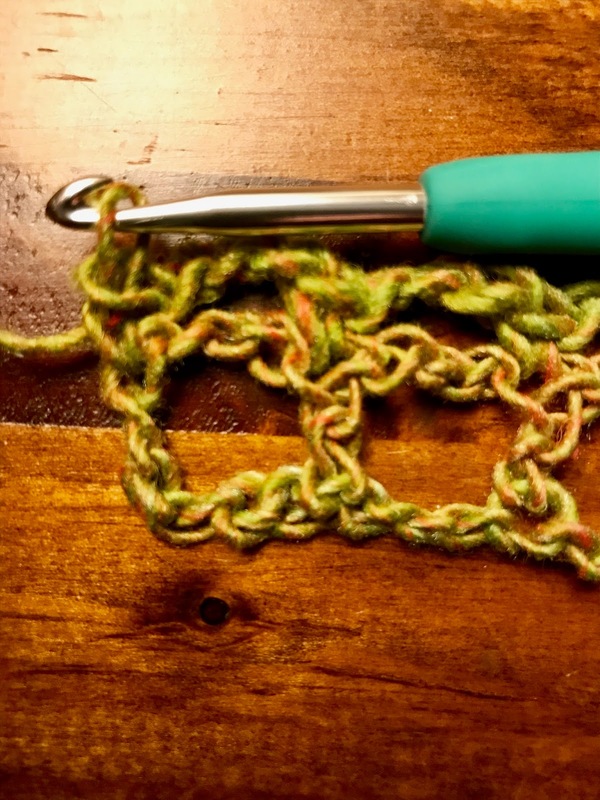 Skip the first dc and the first ch 3 space, single crochet (sc) in the next dc, *ch 3, skip the ch 3 space, sc in the next dc*. Repeat from * to * until you reach the end of the row, ending with a sc in the 4th chain from the hook. Turn. Repeat Rows 2 and 3 until the scarf is about 60 inches long, or you have achieved your desired length. End with Row 2. Fasten off, leaving about a 21 inch tail. 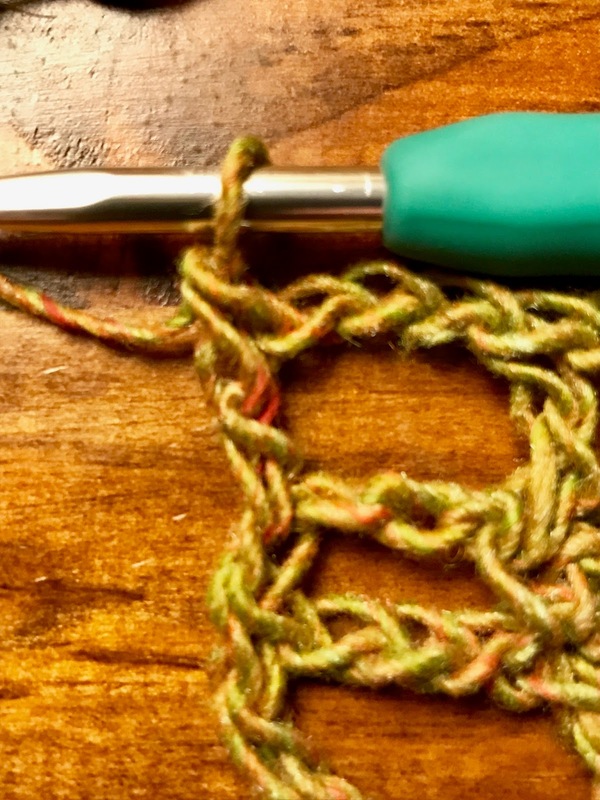 Thread the tail through a yarn or tapestry needle. Line up the two edges so that the trellis squares match up identically. 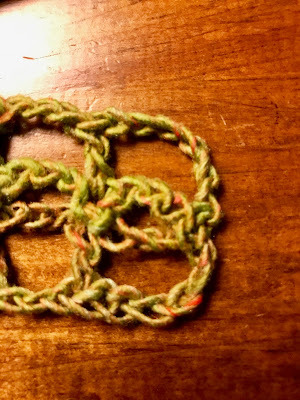 Stitch back and forth between the two ends, sewing them together to create a circle. Weave in the end and trim. For this variation, I used 2 skeins of Plymouth Vizions yarn (68% Rayon, 29% Linen, 3 % nylon (polyamide)) 50 g = 98 yds (DK weight) and a size H (5.0 mm). You will also need 75 Number 8 glass beads in the color of your choice (A), and 39 number 6 glass beads in the color of your choice (B). The foundation chain is 30, rather than 50 stitches, resulting in 6 trellis square across, rather than 11. 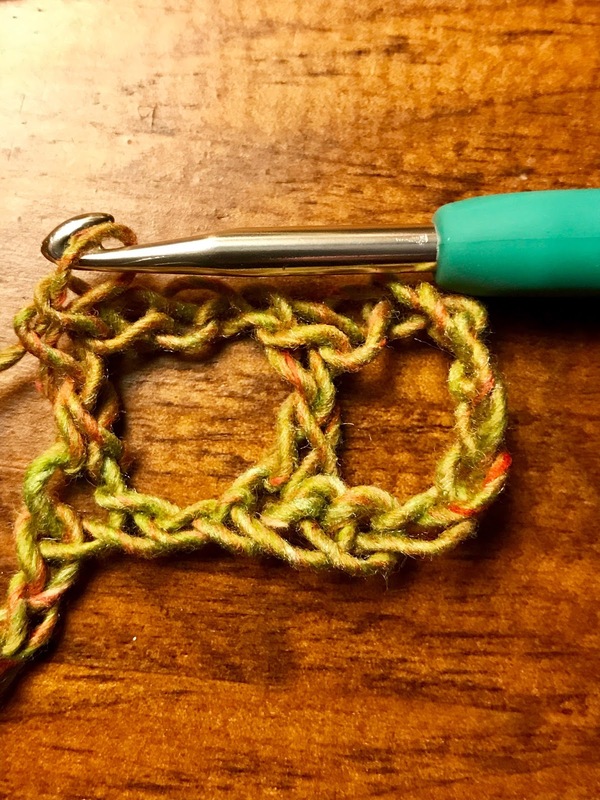 It is worked exactly the same as the directions above for the Double Trellis Crocheted Cowl/Infinity Scarf, but to a length of approximately 55 inches. Be sure your last row is a Row 3. After you fasten off, string the beads onto your remaining yarn skein as follows: 25 (#8) glass beads in color A, 13 (#6) glass beads in color B, 25 (#8) in A, 13 (#6) in B, 25 (#8) in A. For Beaded section: Using a slip stitch, attach your yarn to the beginning of the row of one end of the scarf, right side facing you. Row 1: Ch 1, sc in the first dc, *three sc in the next ch 3 space, sc in the next dc*. Repeat from * to * until you reach the end of the row, ending with a sc. You should have 25 sc in the row. Turn. Row 2: Ch 1, bead sc (bsc) in each sc across. 25 bsc in color A. Turn. Row 4: Ch 1, *1 bsc, 1 sc*; repeat from * to *, placing a bsc in every other stitch until you reach the end of the row. End with a bsc. 13 bsc in color B and 12 sc. Turn. Row 5: Repeat Row 1. Row 11: Repeat Row 1. Fasten off. Leave a tail about 21 inches long. Sew the ends together as directed in the Double Trellis Crocheted Cowl/Infinity Scarf instructions. I hope that you enjoy this pattern! Feel free to use it for any purpose you wish, but I ask that you please give me credit for the design, and if you reference it, please link back to this site. Tell me about your experiences with this pattern, and I would love to see photos, if you would care to share them! 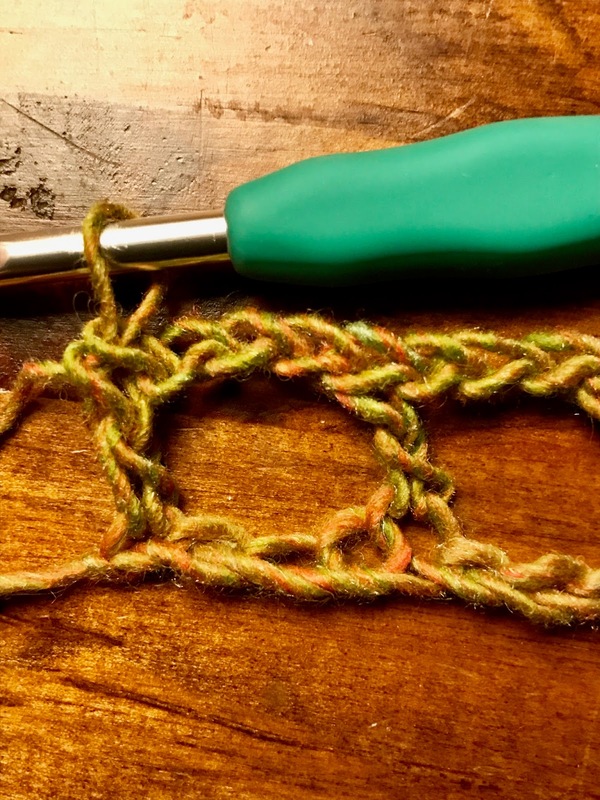 In response to a comment, below, I am posting some photos of the beginning and ends of the rows, as I work them. I hope it will be helpful. This is extremely beautiful and simple. I personally do not crochet but appreciate the colors chosen and the different media used with the beads. Very nicely combined and inspiring. Thank you and congratulations. In Row 3 you are missing the * around the part to repeat. I assume it's the "ch 3, skip the ch 3 space, dc in the next sc." part of the row? Good eye! Thanks for letting me know! I've made the fix in the pattern. I'm loving this scarf - so easy to crochet, but still has a light, open look. However, I'm nearly halfway through and I'm finding that one side is shorter than the other - it seems that my dc is shorter than my 2 ch, since the side at the end of row 3 (dc into last ch) doesn't have as much height as the other. I'm wondering whether this will help/hinder the drape on the final product - since it is a loop it might be ok to have a smaller inside. If not, maybe I'll make row 2 a ch5 to start. Your thoughts? Hi Sylvia, I tried working a few rows of the pattern in a bit heavier yarn to allow you to see the stitches better (I hope). The ends of my rows are coming out evenly when I match up the sides. The comment section will not let me post photos, so I am going to add an addendum to the blog post itself (above) to show the photos of the rows being worked and you can see the ends of each row. I hope it helps. I can tell you I have worked this pattern a few times and have not experience any problem with the drape. 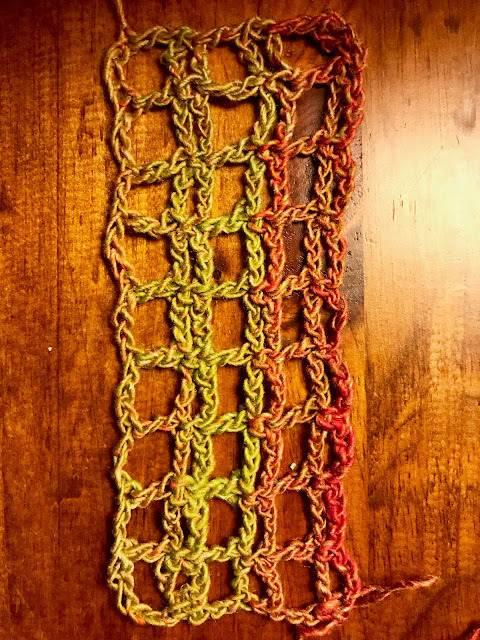 Let me know if you have any other questions and I'd love to know how your scarf turns out -- hopefully, you will be pleased with it! Sylvia, I'm so glad it worked out! I love crochet ... I've been doing it since my grandmother taught me how when I was a child. I hope you continue to enjoy it! Wishing you all the best! Hi Sylvia - I'm so happy you like the pattern! Sorry to hear you are having trouble with things coming out evenly. You should have a ch 3 at one end of the row and a dc at the other end. Perhaps that is the problem, if you have a ch 2 instead? Later today I will crochet a few rows and post a close-up photo -- maybe that will help clear things up. I will post the photo as a response to your comment, so you will see it right away. Angela, I love how this pattern works up. Thank you! I am making it with a dark taupe baby alpaca, which is turning out nicely.